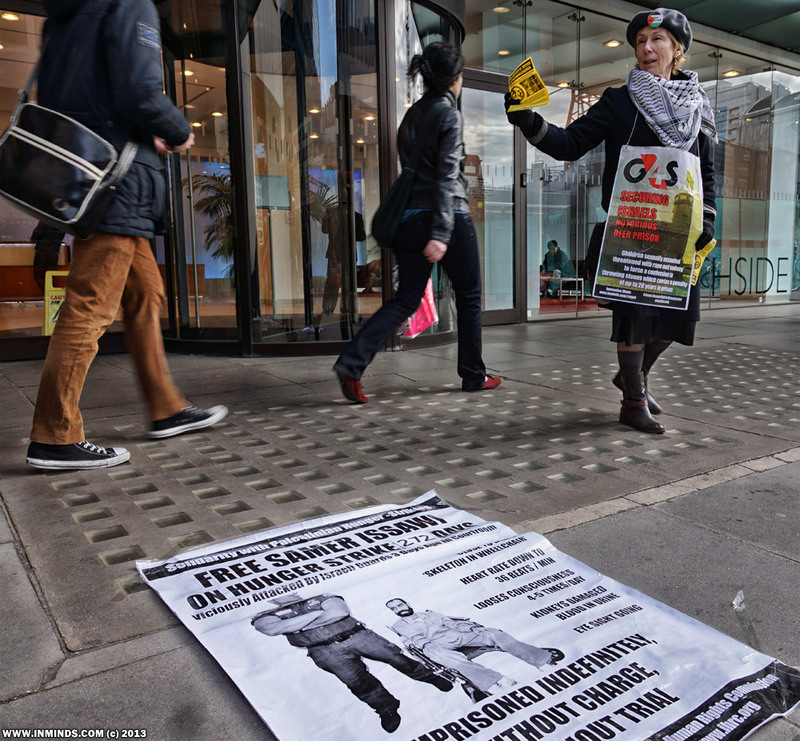 As part of Palestinian Prisoners Day commemoration on Friday 19th April 2013 activists targeted G4S for its complicity in the torture of Palestinian children; and in Israel's illegal system of Administrative Detention. 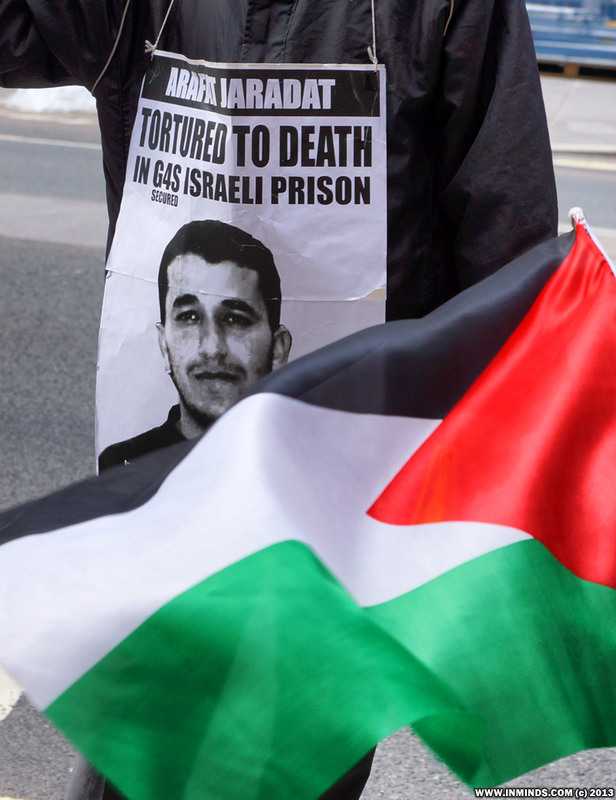 On 23rd February Arafat Jaradat, a Palestinian father of two, was tortured to death in G4S secured facilities - he died in Megiddo prison following several days of torture in al-Jalame interrogation centre. 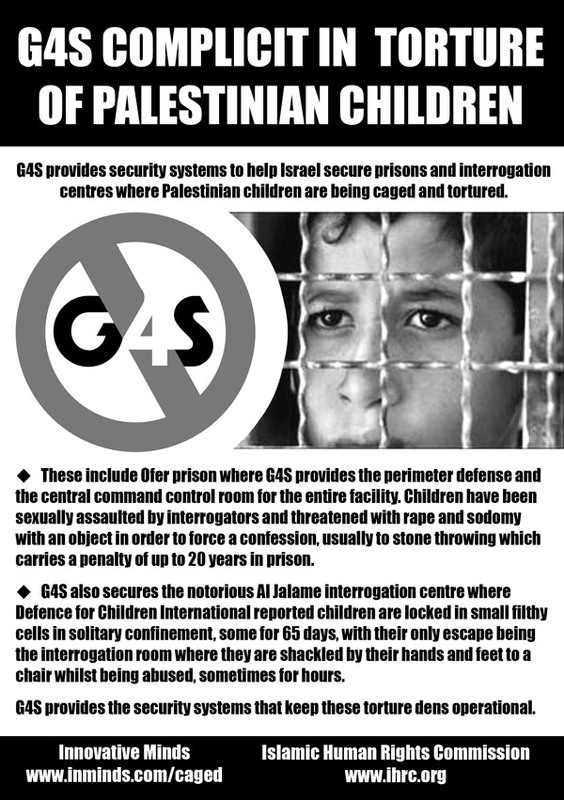 At Megiddo the whole central command room is provided by G4S, which also provides security systems for the notorious al-Jalame interrogation centre in northern Israel with its infamous Cell 36 where Defence for Children International reported children are locked in small filthy cells in solitary confinement, some for 65 days, with their only escape being the interrogation room where they are shackled by their hands and feet to a chair whilst being abused, sometimes for hours. 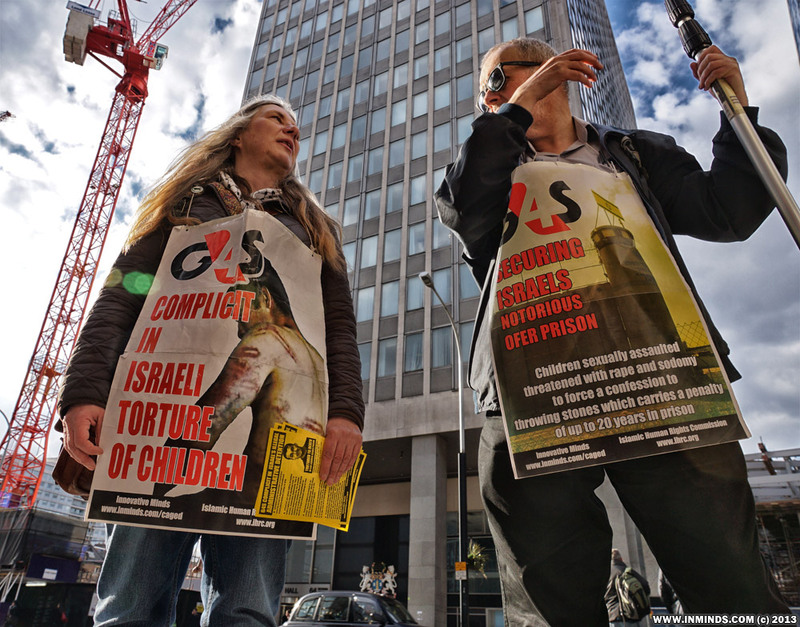 Administrative detainees, who are held indefinitely without charge or trial, are also caged in G4S secured prisons such as Ofer in the occupied territory where G4S provides the perimeter defense system and the central command control room for the entire facility. 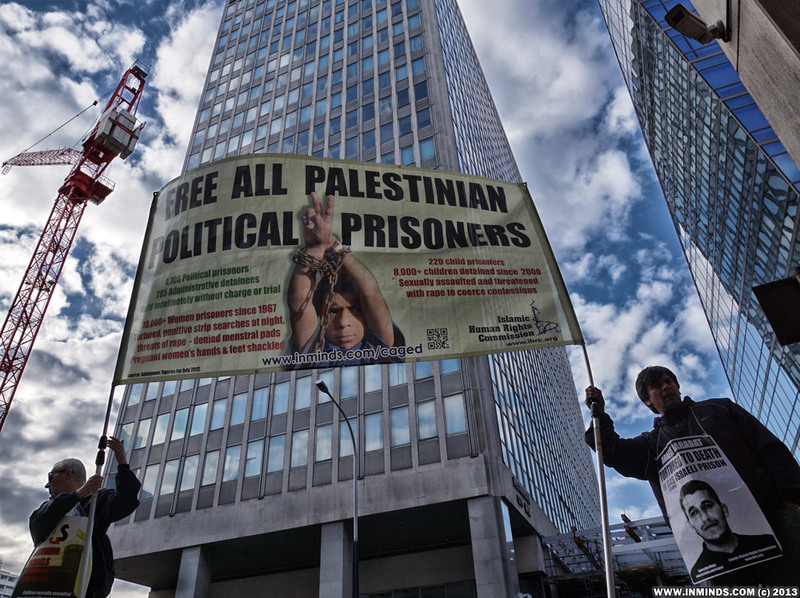 Addameer the Palestinian prisoners support group in Palestine had requested that activists around the world campaign and expose this inhumane practice of Administrative detention as part of this years Palestinian Prisoners Day activities. 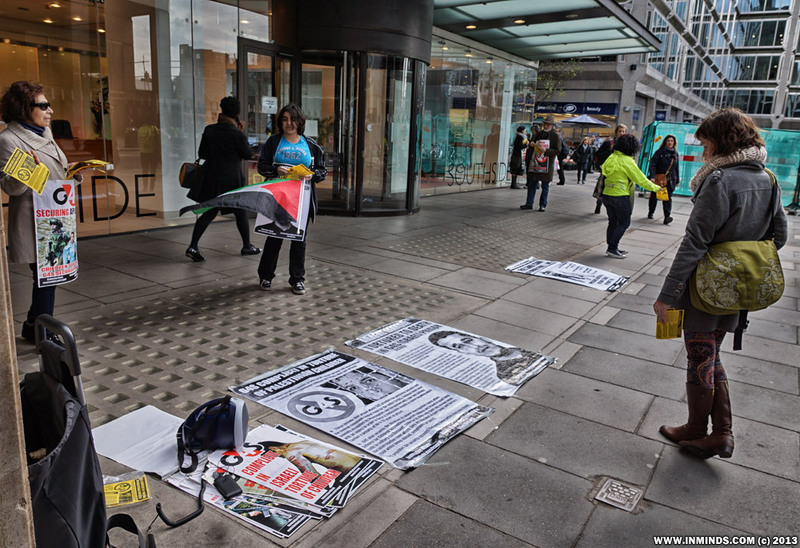 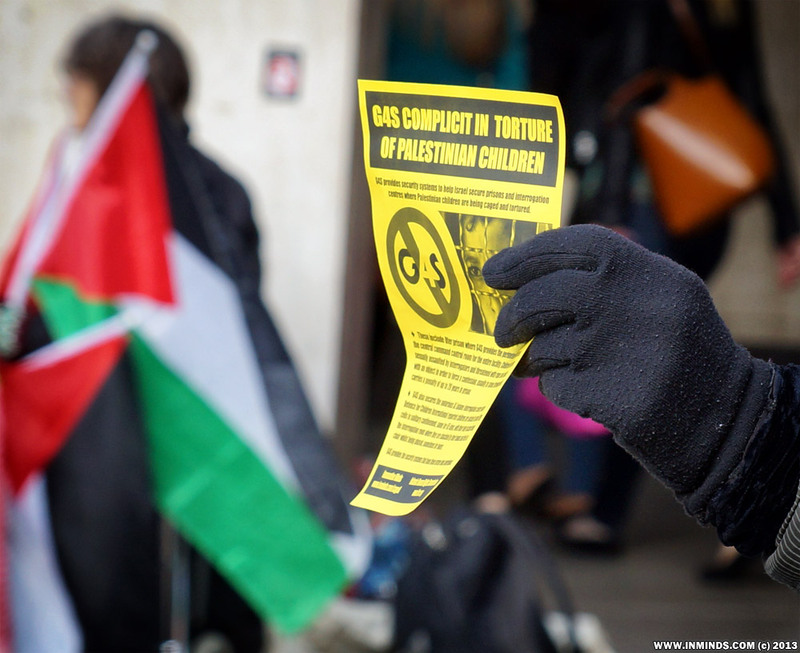 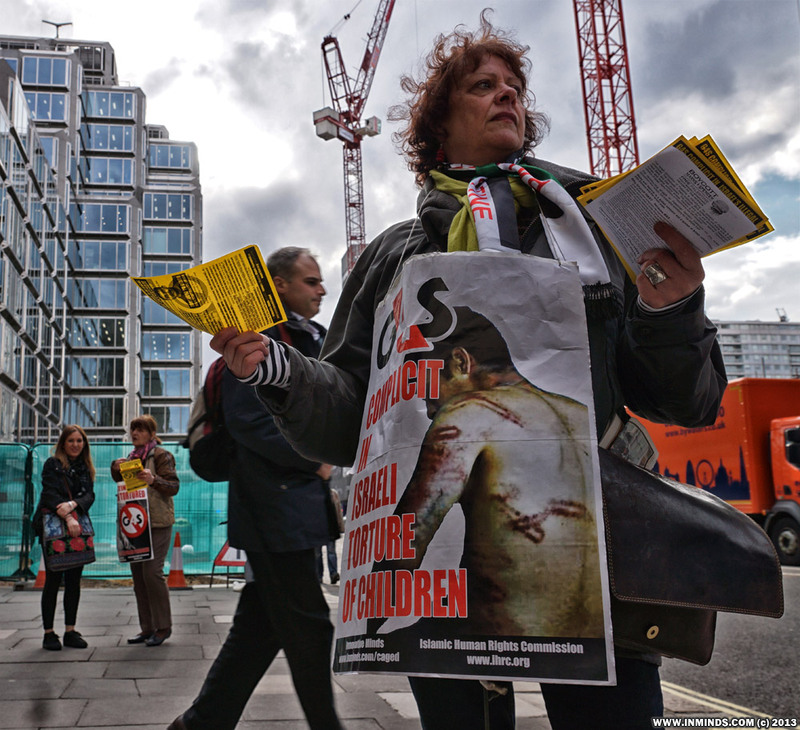 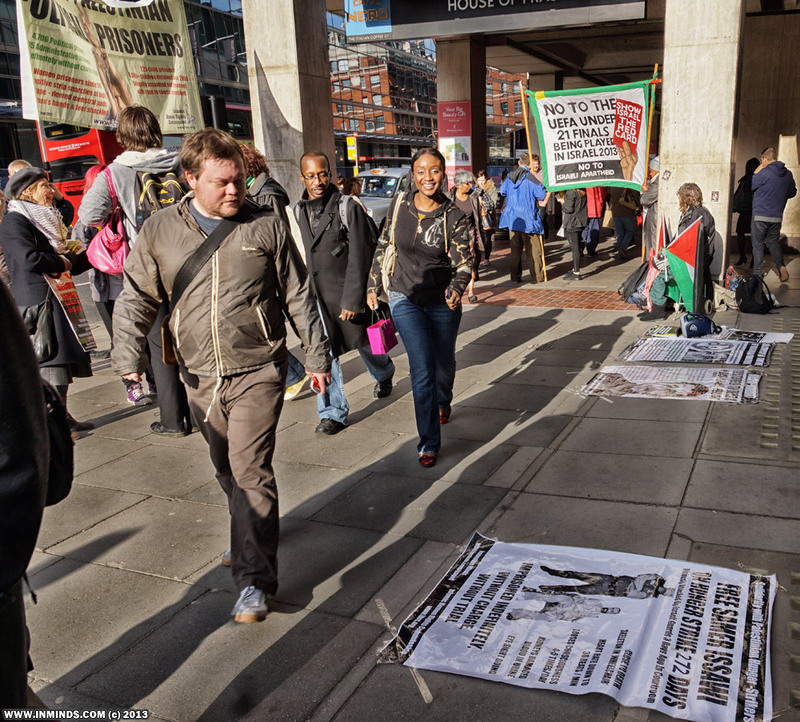 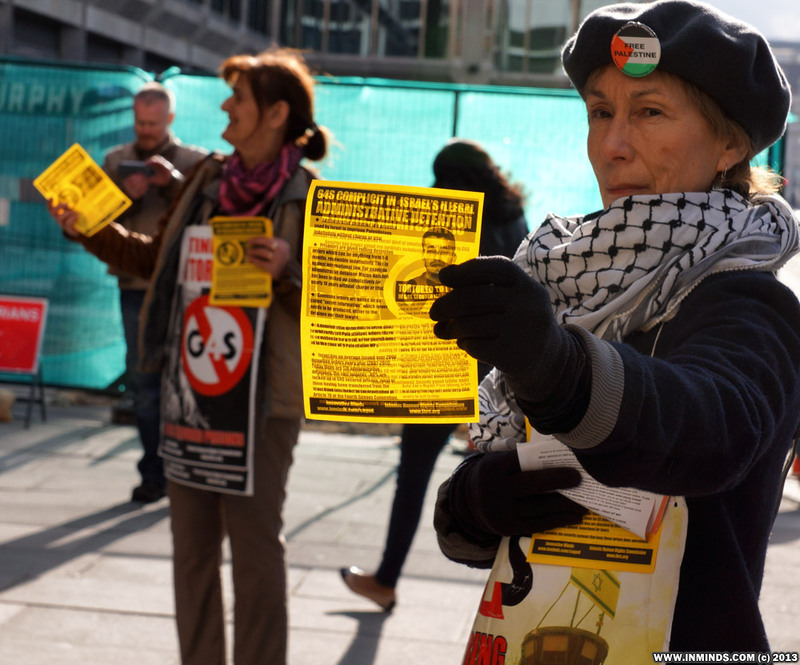 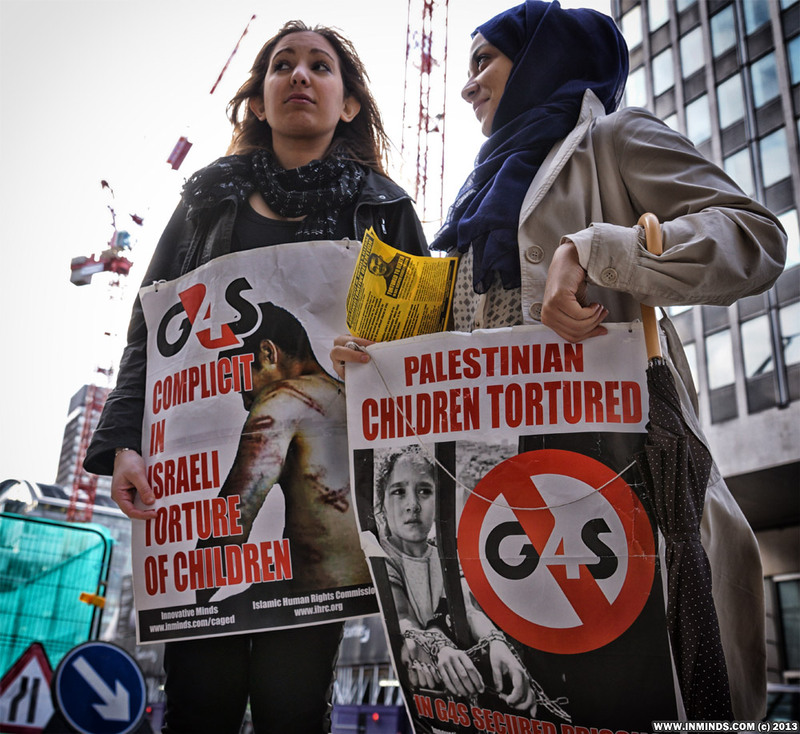 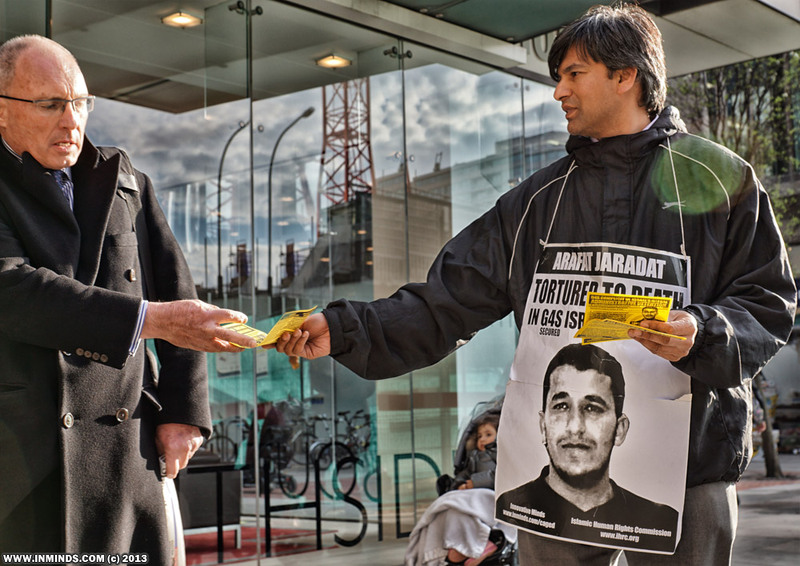 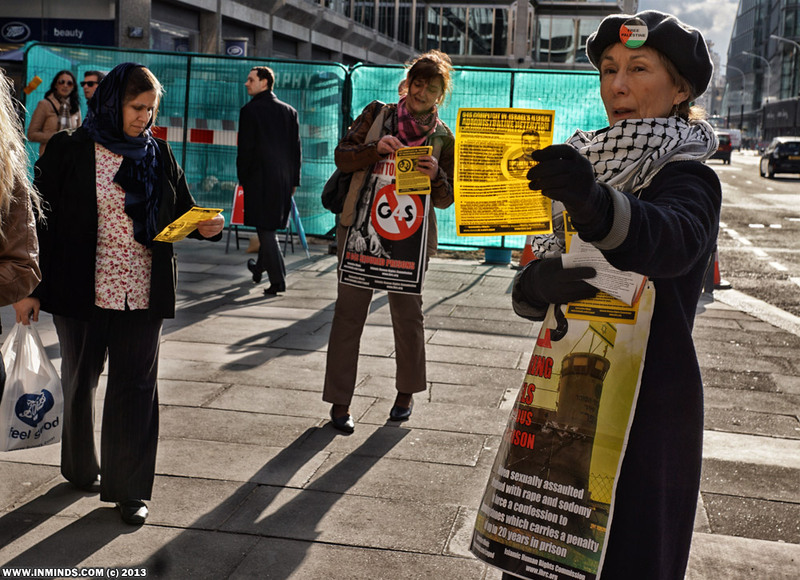 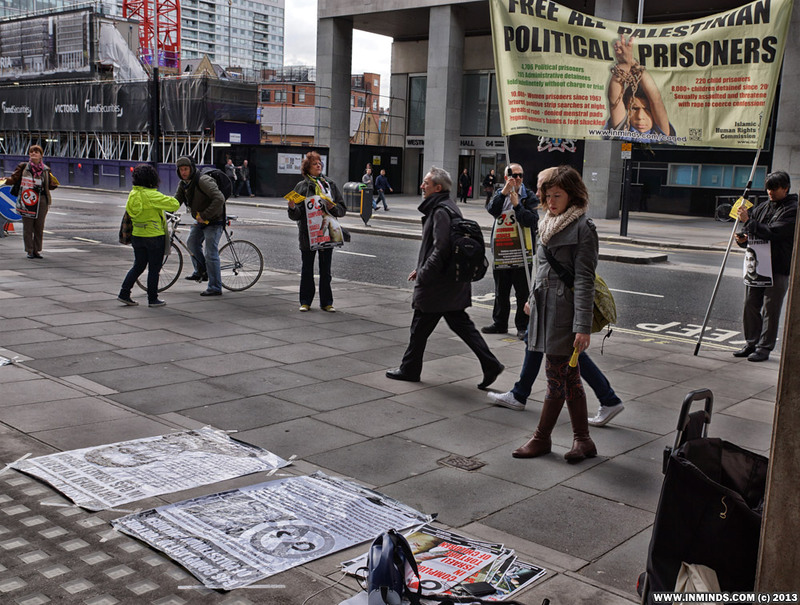 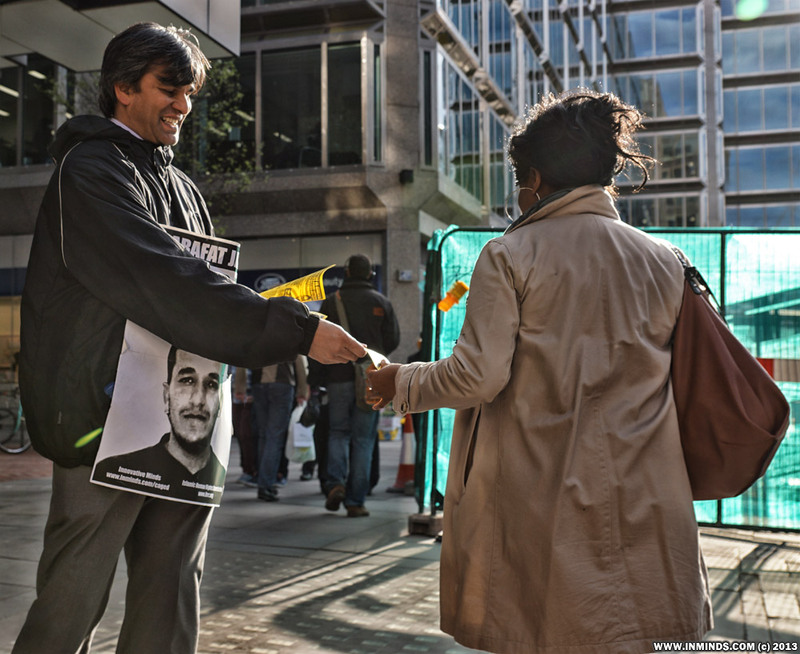 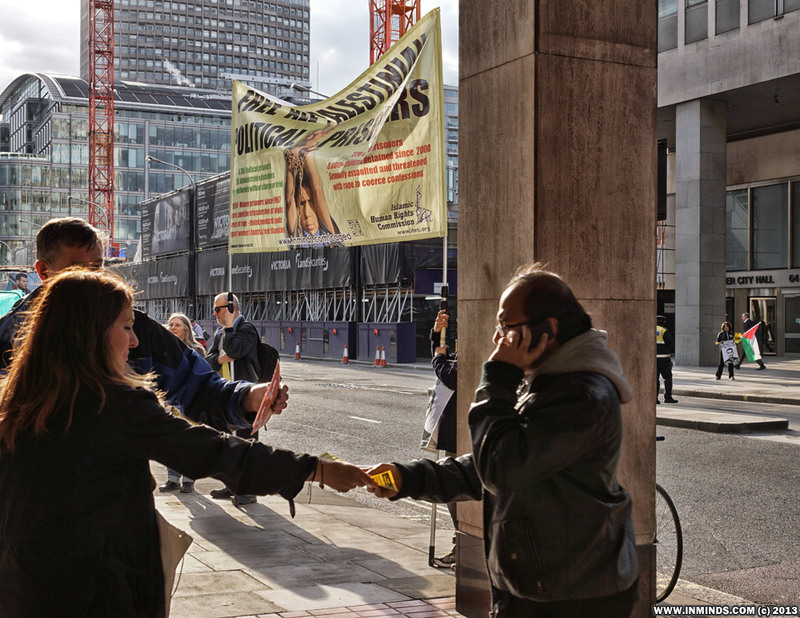 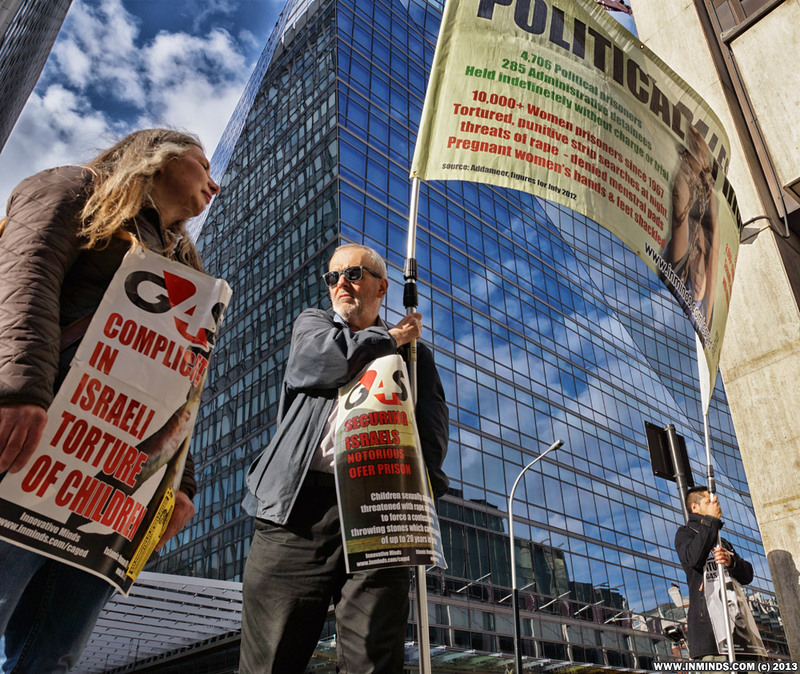 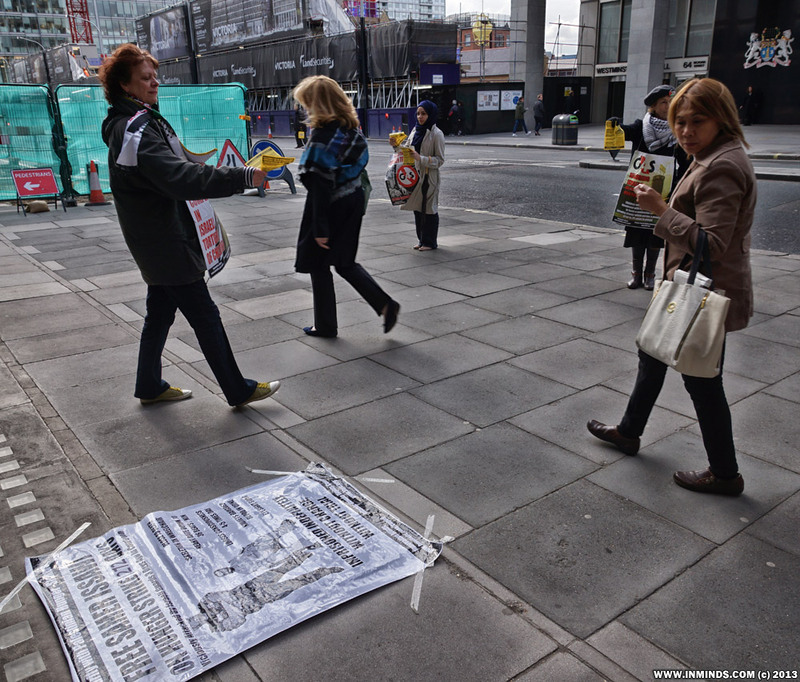 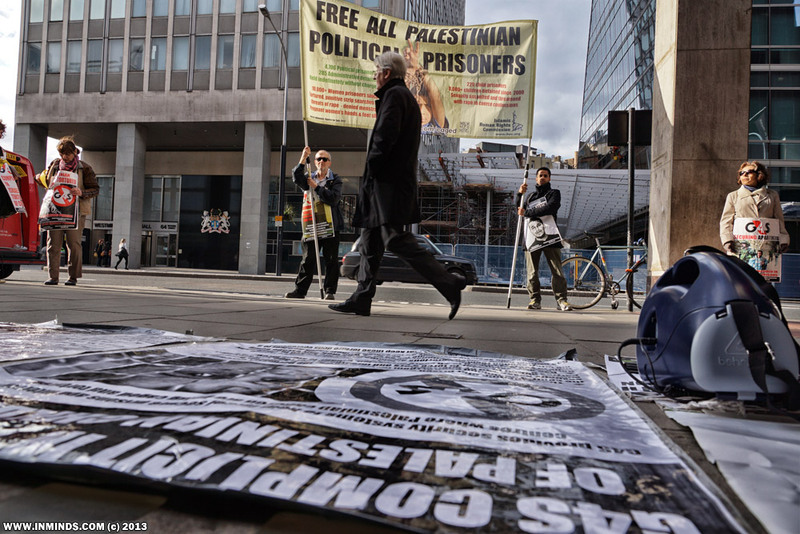 On Friday 19th April 2013, G4S's London HQ was beset with a second protest in the week marking Palestinian Prisoners Day. 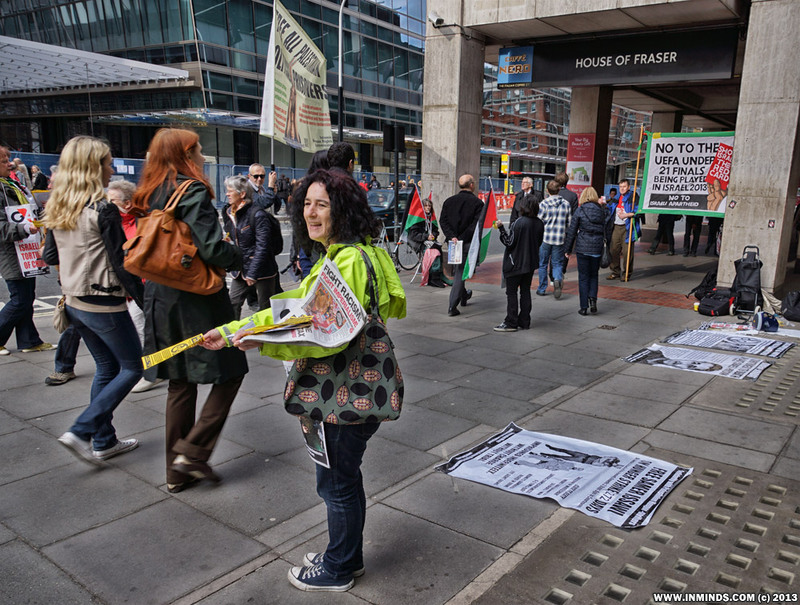 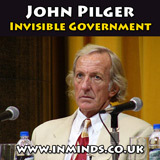 Security rushed to quickly bolt the doors shut to prevent an occupation as had occurred a weeks back at our previous protest, but this did not prevent activists from sharing with the public the dirty secrets of this corporation, its business of death and suffering in Palestine. 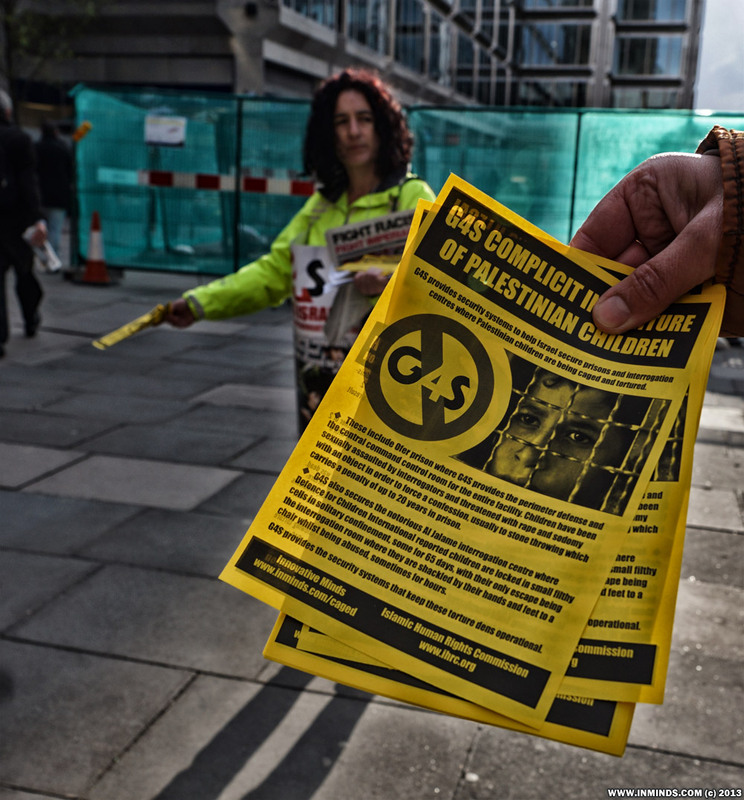 In fairness the security guards did explain they they did not work or care for G4S, they were simply employed by the building which housed many offices including G4S which had the entire 5th floor. 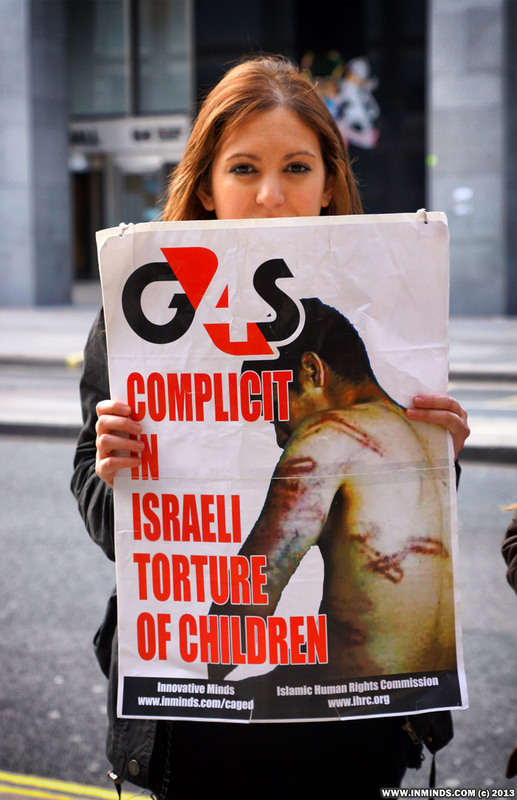 One even confided as to what the he thought the real meaning of the 'S' is in 'G4S' was.. it rhymes with 'hit'. 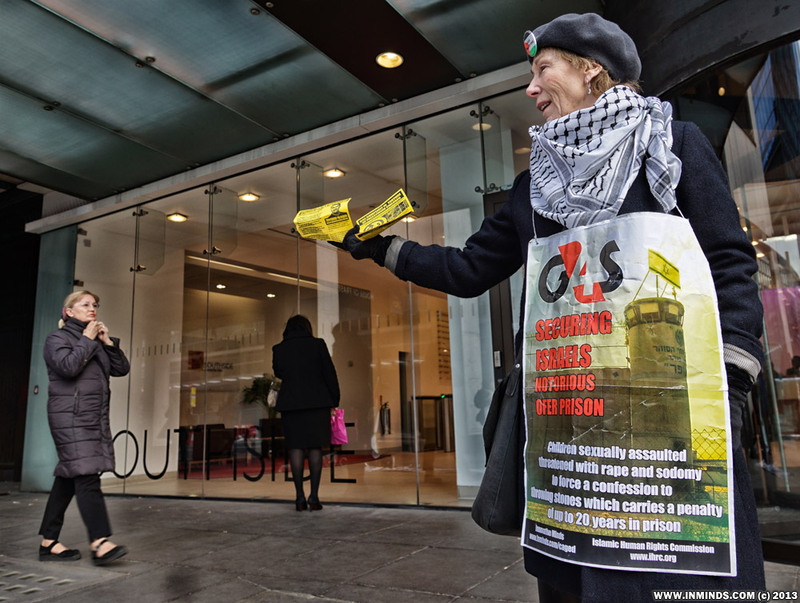 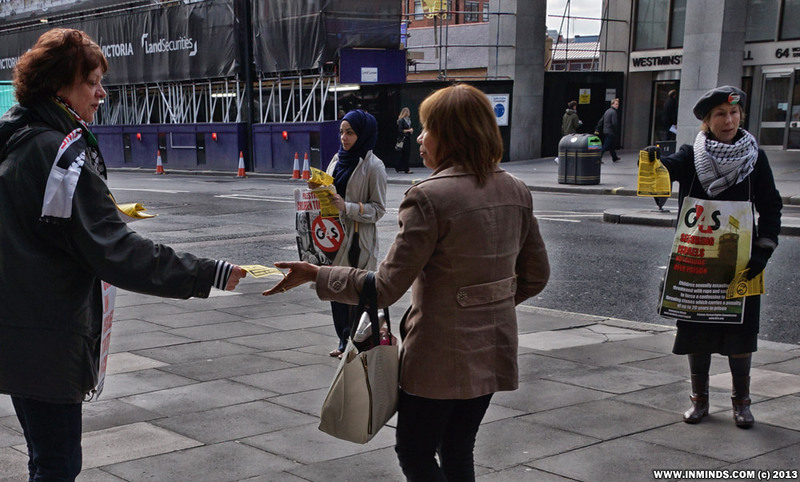 The public were really receptive to our message with many people stopping to read each information poster on G4S and its complicity in the torture of Palestinian children and the recent torture to death of Arafat Jaradat in a G4S secured Israeli dungeon. 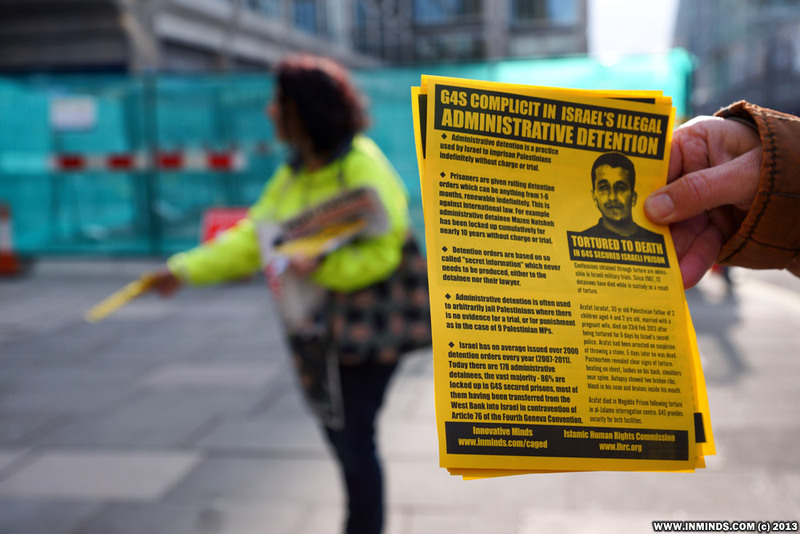 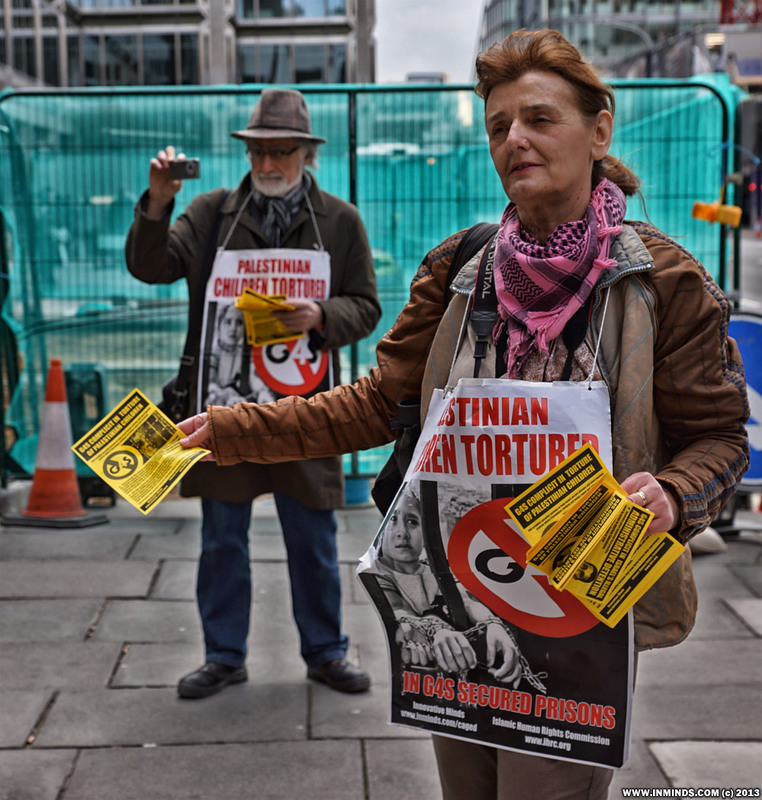 Our leaflets this week explained G4S's complicity in Israel's illegal practice of indefinite imprisonment without trial called Administrative Detention. 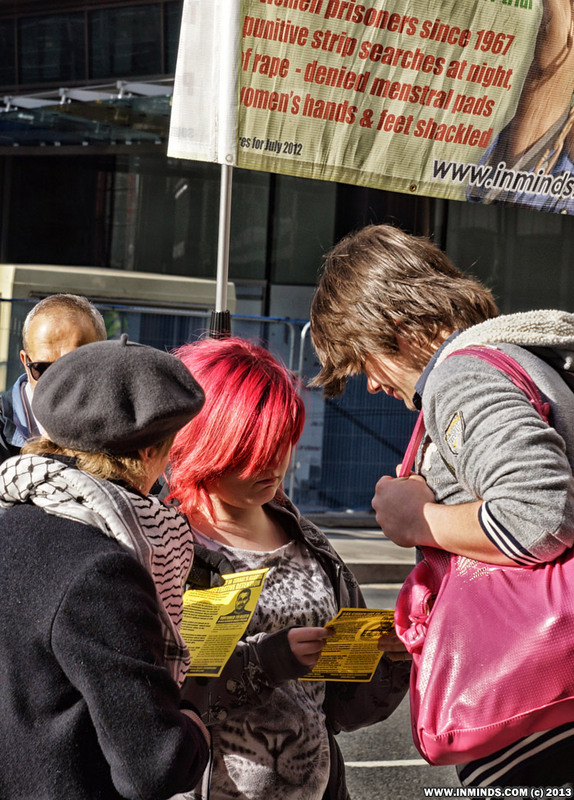 They were very popular and we quickly ran out. 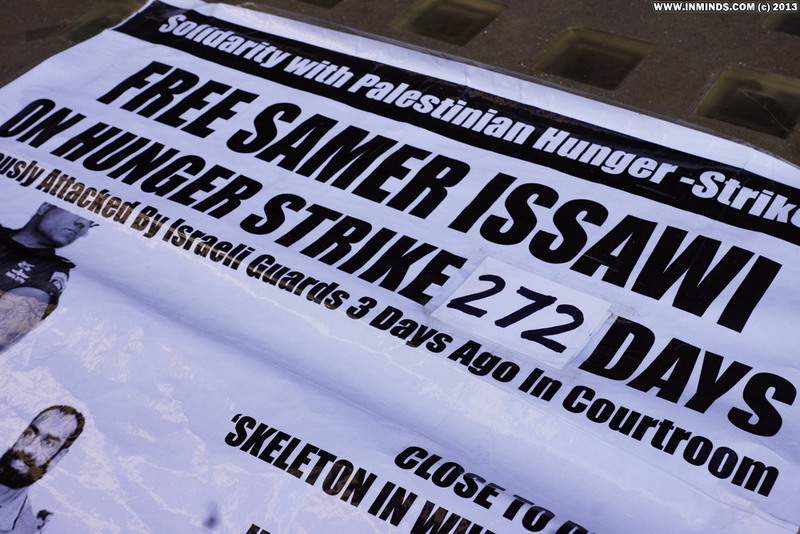 As always, we stood in solidarity with the Palestinian hunger strikers, in particular Samer Issawi now 272 days without food, miraculously starring death down to live another day. 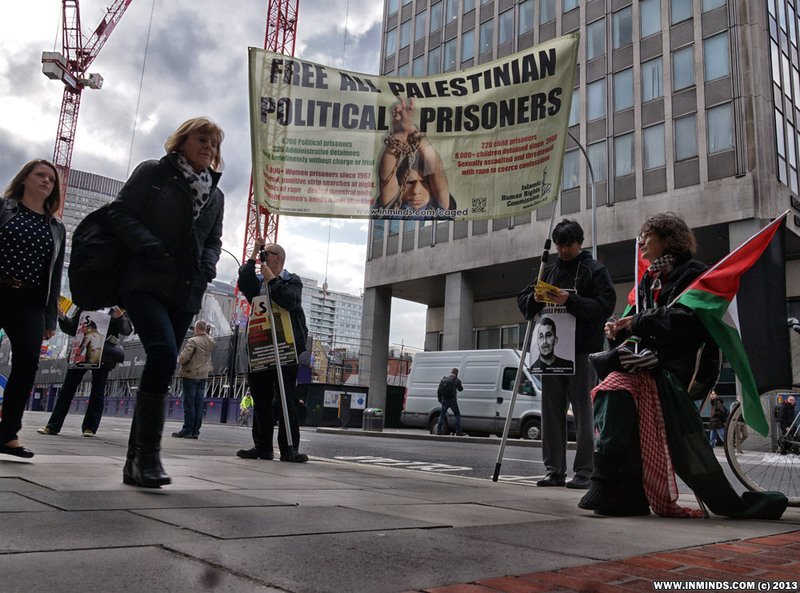 Shackled to a bed in Kaplan hospital Samer Issawi smuggled a letter out via his lawyer on the occasion of Palestinian Prisoners Day in which he asked for the Ummah and all free peoples of the world to make Prisoners Day a day of anger and solidarity with all political prisoners, he also stressed that there "should not be the only day on which there is solidarity with the political prisoners, but there must be daily solidarity protests". 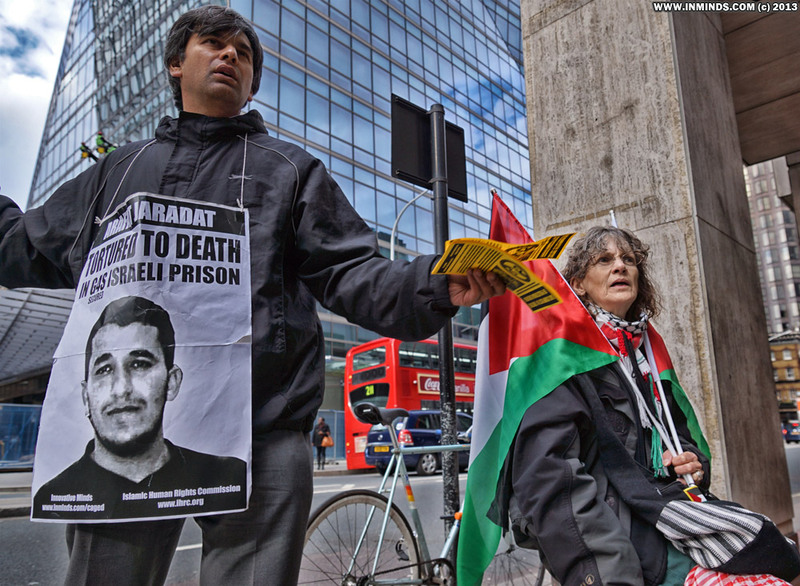 Samer also described how inside the Israeli prisons the jailors are "attempting to increasing harassment against the prisoners, in order to make them frustrated and desperate, and to make them feel as if they are alone in their struggle, forgotten by their people, and as if they were not arrested while they were struggling for the freedom of their people..", despite this the prisoners "continue their resistance to obtain their rights and defend their dignity". 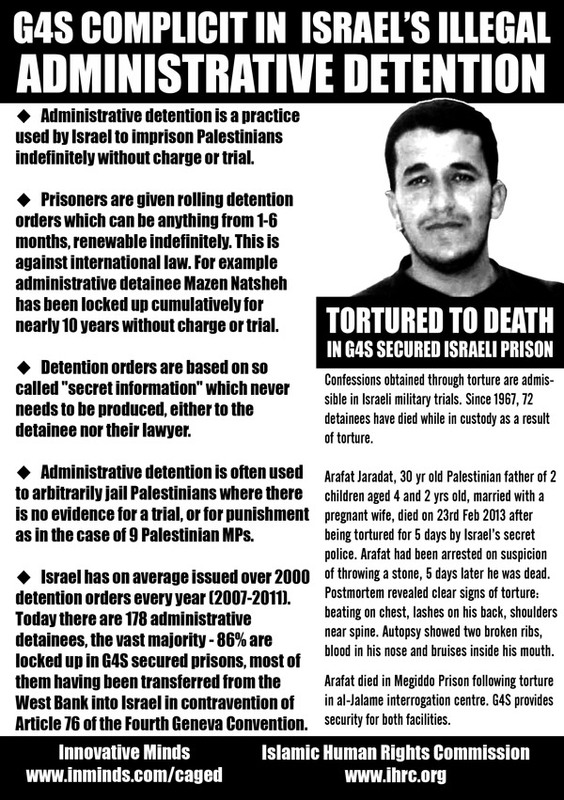 In his letter Samer also remembered the forgotten prisoners, rotting in Israeli jails for over 30 years: "Despite the fact that as long as there is an occupation, there will be political prisoners, we should not leave them to suffer inside these prisons endlessly, like what happened to the veterans among them who are still inside the prisons after more than 30 years. 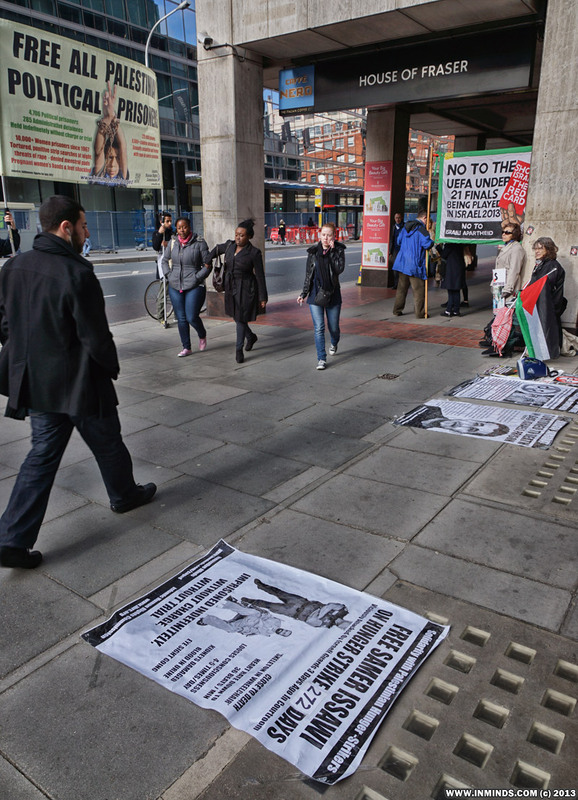 This is a shame upon humanity, and a disgrace upon every free revolutionary who does not engage in any action for the sake of these heroes." 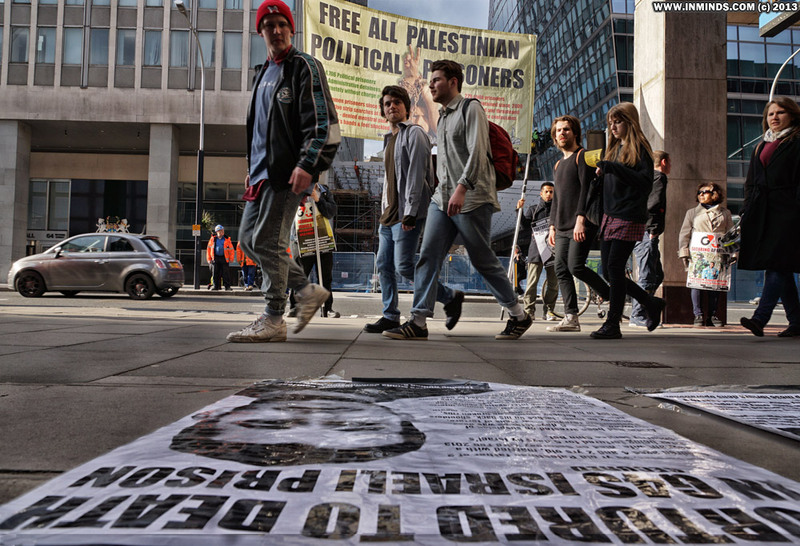 A part of Samers message was addressed to fellow prisoners "My message to the prisoners is to remain united and to build up the prisoners’ movement as one body.." We feel this call for unity should also resonate among those working in solidarity with the prisoners. 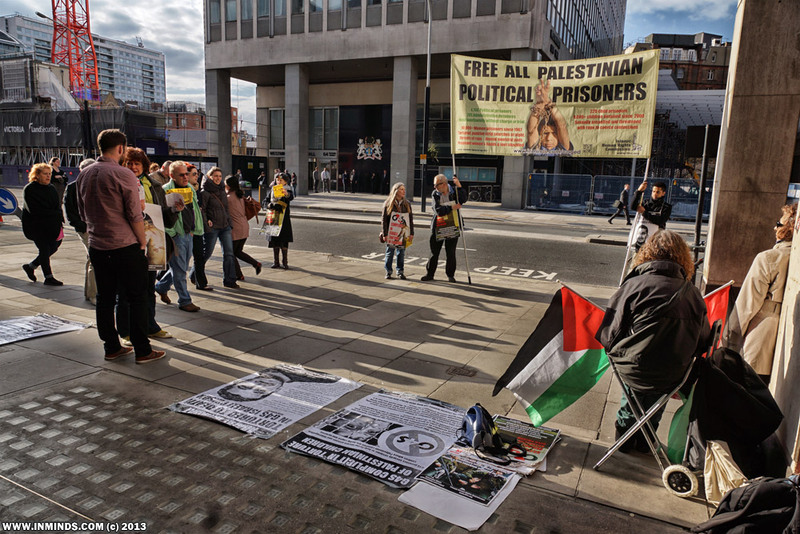 It was shameful to see the main Palestine Solidarity Campaign group in the UK refusing to publicise this protest in solidarity with Palestinian prisoners on their website and go further to actually delete mentions of this protest on their facebook page and punish those people who had posted it by banning them from making any future posts. 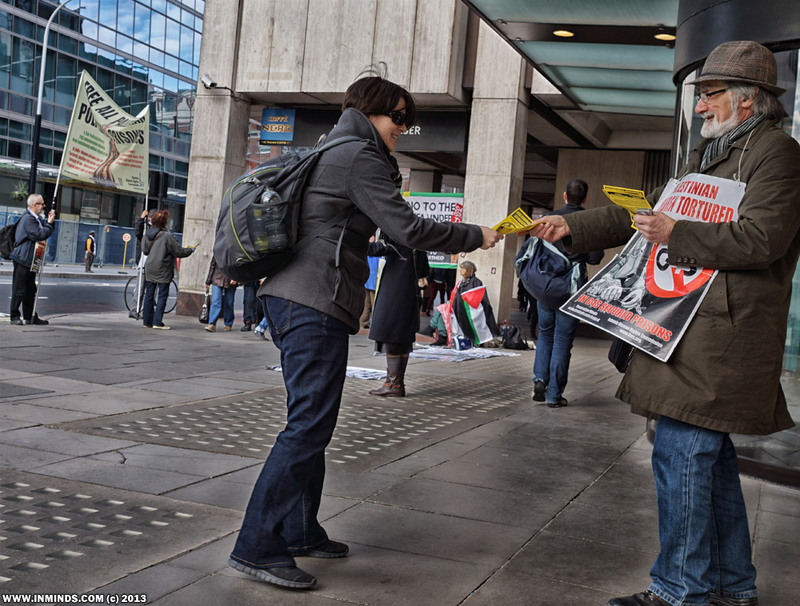 It beggars belief that an organisation created for the sole purpose of solidarity with the Palestinian cause could behave in this manner..
Samer ended his message selflessly "As for any act of solidarity with me, I thank you and appreciate this, but don’t want any acts of solidarity to be for me. 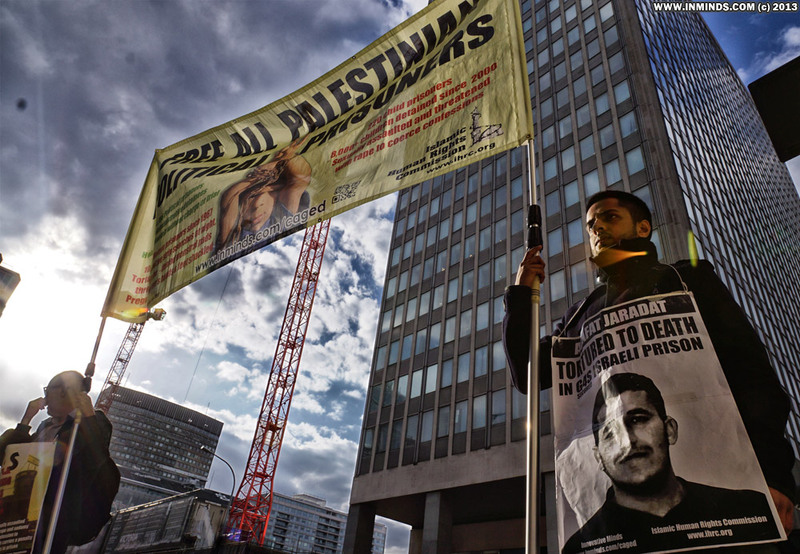 I am waging this struggle on your behalf and on the behalf of all Palestinians, and any action should be aimed at obtaining results for the entire prisoners movement, and I am one of you.."
The english translation of Samers's message was by @docjazzmusic (docjazz.com), the same docjazz whose song 'Hunger' is a favourite which we play at all our prisoners protests!